Just a quickie post for my demo friends who have already received this set at the catalog premiere, and for my customers who may want to order it in the wood-mount option, when it becomes available. The blocks are a very close fit in the case so, taking a hint from my stamping sister Trina, I took a picture so I can figure out how to get them back in the case when I'm finished with them. Thanks for the awesome idea, Trina!!! This was the set I used on yesterday's card. Have a crafty day! Last night I had the delightful opportunity to attend the Stampin' Up! New Catalog Premiere live event in Long Beach, CA. You are in for such a treat when you get your own copy of the catalog!!! Hold onto your purse strings because, if you're anything like me, you're going to want almost everything in there! In addition to being introduced to the new layout of the catalog, which is so much easier to navigate, there were demonstrations of some of the new products, and of course, gifts for all attendees! 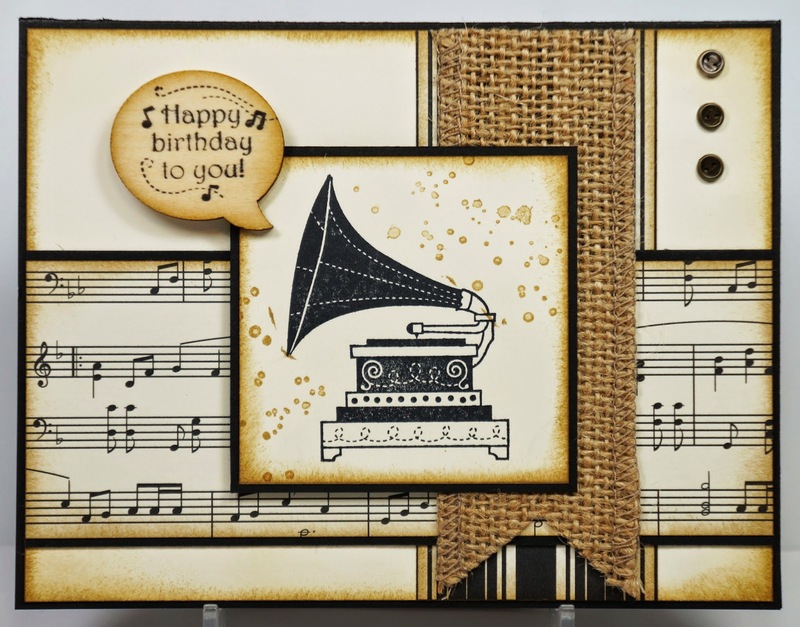 The live event was broadcast to demonstrators in select theaters around the U.S. and Canada, and everyone got their own copy of the new catalog, the new Stampin' Success magazine (exclusively for demonstrators), and a new stamp set called Work of Art. I have a bunch of thank you notes to send to the various presenters, but my first one, shown above, is going to Shelli Gardner, co-founder and CEO. She was there last night, looking radiant, and never let on how tired I'm sure she must have been, since she's still recovering from her very serious horse riding accident last year. This card uses the chevron stamp and the Thank You, both from Work of Art. The "Best Catalog Launch Ever" was made with the awesome new Alphabet Rotary Stamp, which makes it possible to create just about ANYTHING you want to say! There are 13 columns of alpha, numeric, and symbol characters. It is so cool! I won Prize Patrol, which SU does at every event. We get different colored wrist bands, and at intervals throughout the event, they announce what the prize will be, and then *drum roll* the wrist band color/design. My prize was three of the new In Colors - Blackberry Bliss, Lost Lagoon, and Hello Honey! The other two colors are Tangelo Twist and Mossy Meadow, which I think is going to be a great Christmas color. Well, as you can tell, I'm still riding high after last night's event. I haven't even gone through the catalog completely, but will do so as soon as I get this posted. I just had to share some of the shtuff! If you need a copy of the new catalog, and you aren't already a customer of mine (who will get theirs in a couple weeks), send me a message so you can get one, too! Ha! That post title makes me think of small, shy leaves, hiding in the background. What it really means is, the Little Leaves Sizzlits Die is on the SU retiring accessories list. I'm very sorry to see it go, because it's been a great addition to so many of my projects. 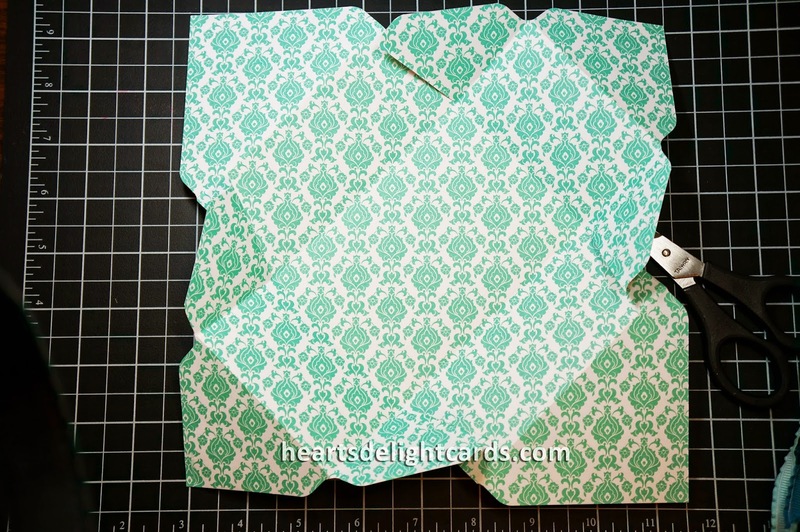 And the Square Lattice embossing folder, too! Waaaahhhh! I'm really hoping there will be something fabulous to replace them in the new catalog (which I get to see on Monday - can't wait)!!! 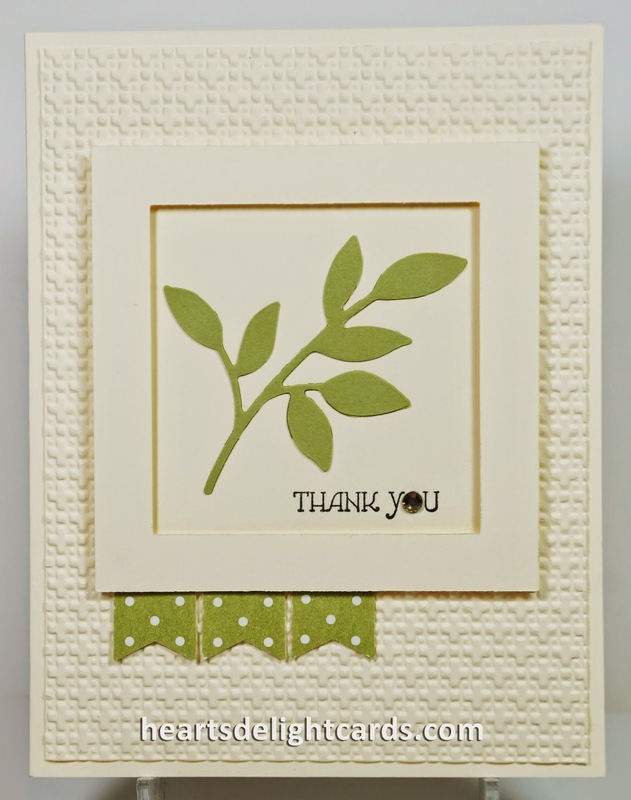 This simple Thank You card was CASEd from Jill Franchette's square version. I made it an A2, adding banners, and a rhinestone in the "you". A little bling never hurts, right? 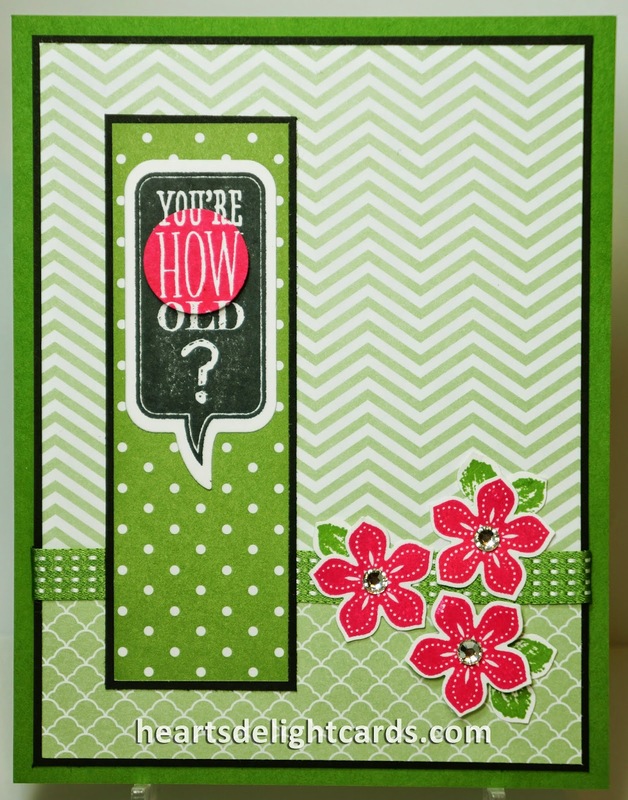 Rather than sponge or stamp the color on the leaf, I used Pear Pizzazz cardstock to keep it even simpler. Today is the last day for the Free Shipping special from Stampin' Up!, so if you'd like to order the Little Leaves Sizzlits Die (only $5.50! ), or anything else, and have it shipped to your house for FREE, better do it today! And remember, if you order today, I'll send you a little token of my appreciation. 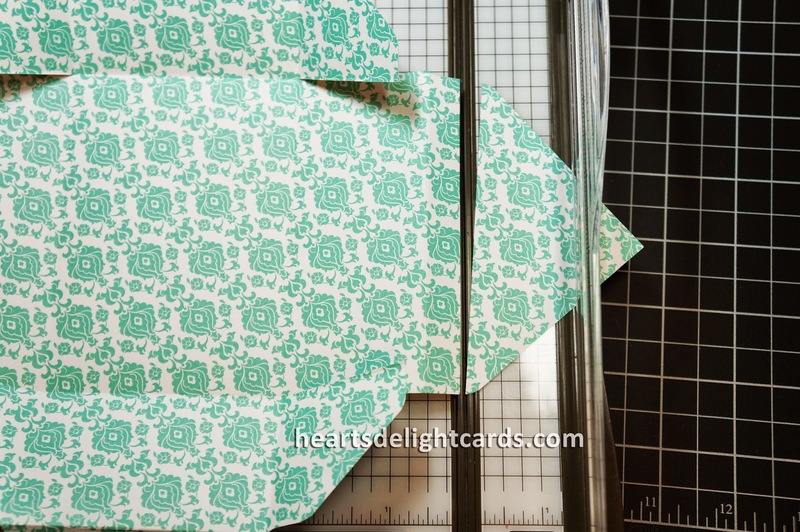 Start with a sheet of 12" x 12" cardstock or Designers Series Paper (DSP), trimmed to 9" x 9". 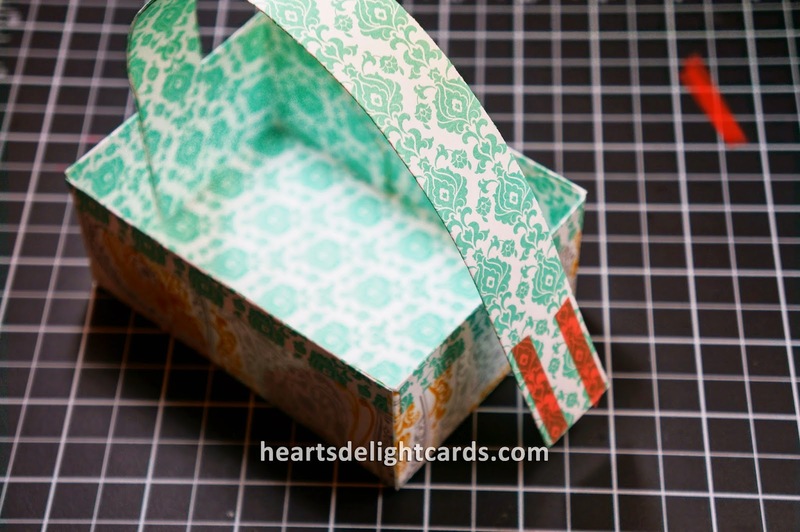 Hang on to the 3" x 12" piece for the basket handle. Using the Envelope Punch Board, place the end of the 9" square DSP at 2-5/8", punch and score. Don't worry if the score line stops short of the edge of the paper - just take the paper out and fold on the scoreline to complete the score. Put the paper back in, slide over to 5-3/8" and punch/score. Now, I realize there isn't a 5-3/8" mark, so you have to slide the paper over 1/8" past the edge of the board, as shown. Trust me, it works! Rotate the paper a quarter turn (90 degrees), line up the pointer with the score lines, and punch/score on both lines. Do the same on sides 3 and 4. Fold on all score lines ("valley" fold on the box bottom, "mountain" fold on the side flaps). Use Paper Snips to cut along sides of largest two flaps to the first score line (box bottom). 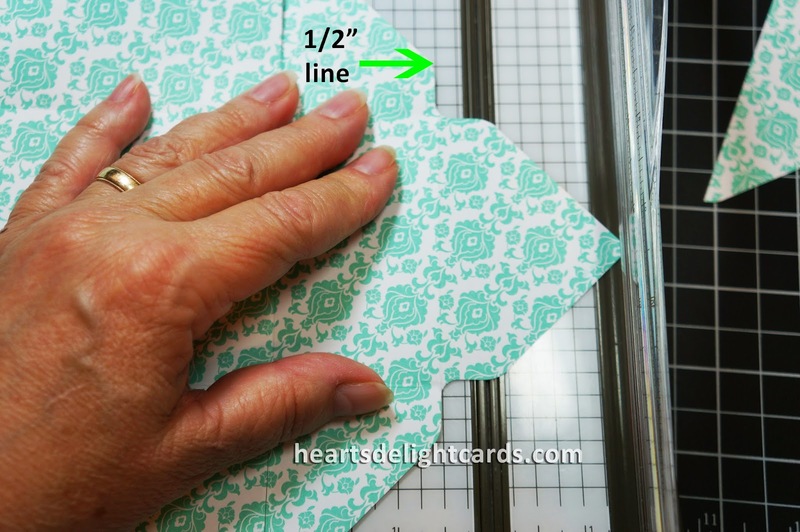 Using the Stampin' Trimmer, line up the score lines of the pointed flaps at the 1/2" line and trim off points. Use SNAIL adhesive or Sticky Strip to adhere side flaps down, then place Sticky Strip on box corner flaps, as shown. Remove liners and form into box, tucking the flaps to inside. 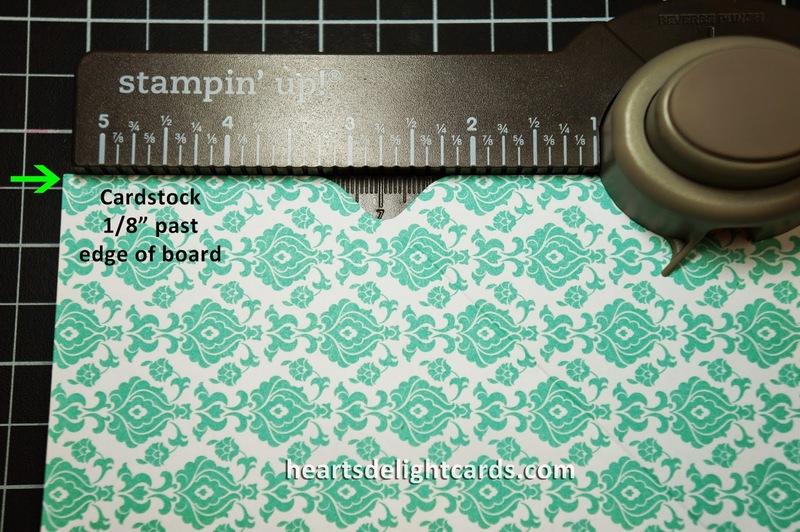 Use the scoring blade on the Stampin' Trimmer, or the Simply Scored tool to score the 3" x 12" strip lengthwise at 1" and 2". 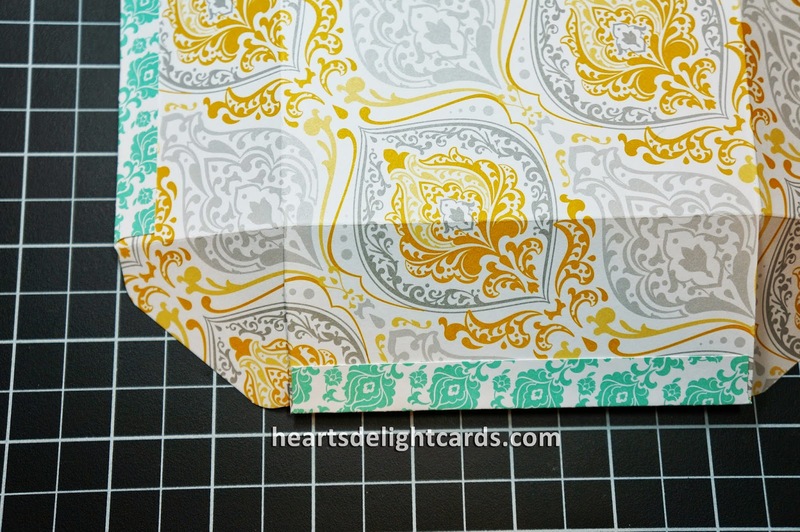 Fold into thirds and crease with Bone Folder. Apple Sticky Strip to one long edge, remove liner and adhere. Use bone folder to give the basket handle a curve. Decorate as desired! 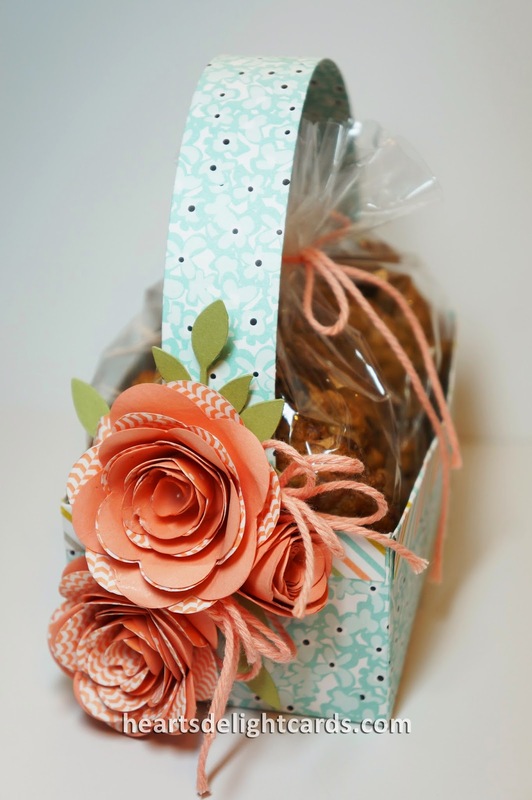 For the original basket, I used the Spiral Flower Die and Little Leaves Sizzlet Die. Finished measurements are 4-5/8" long, 3-1/4" wide, just under 2" tall (without handle). That Little Leaves Sizzlet is retiring!!! As of today, it is still available according to the Retiring Accessories List. Here's the list of Retiring Stamps, too. So many are sold out, already! 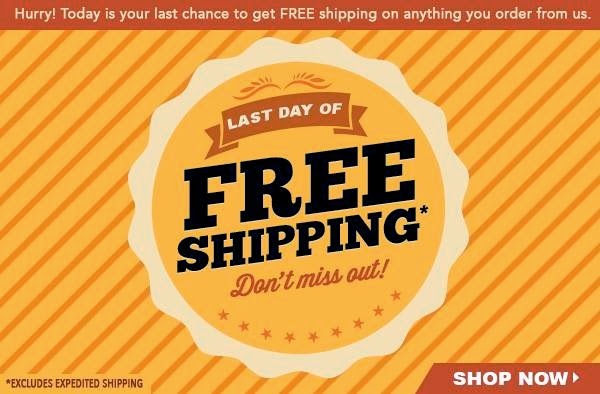 Tomorrow is the last day for the FREE SHIPPING, so be sure you get yours while you can and save on shipping! And if you place an order through me before the Free Shipping offer ends, I will even send you a little Thank You gift. It might be ribbon, or embellishments, or something else. But you'll never know if you don't order! I do! 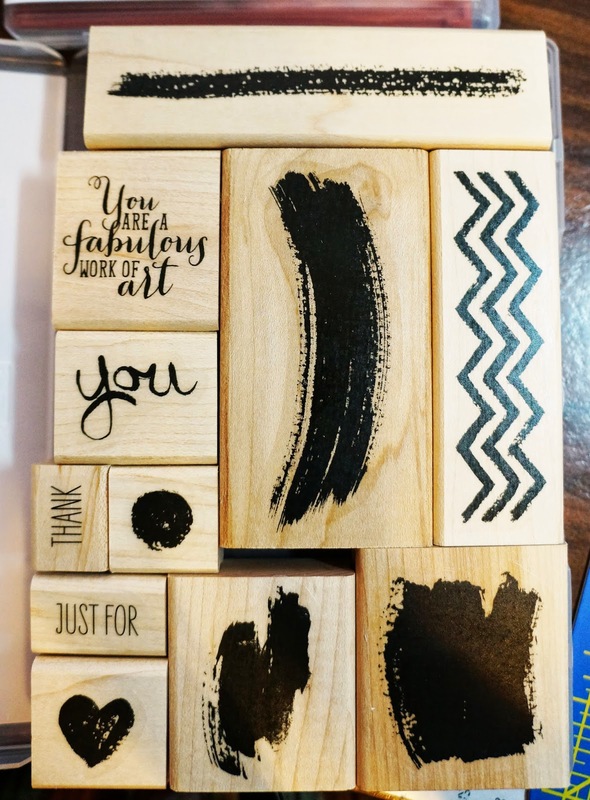 And you should love it, too, because Stampin' Up! 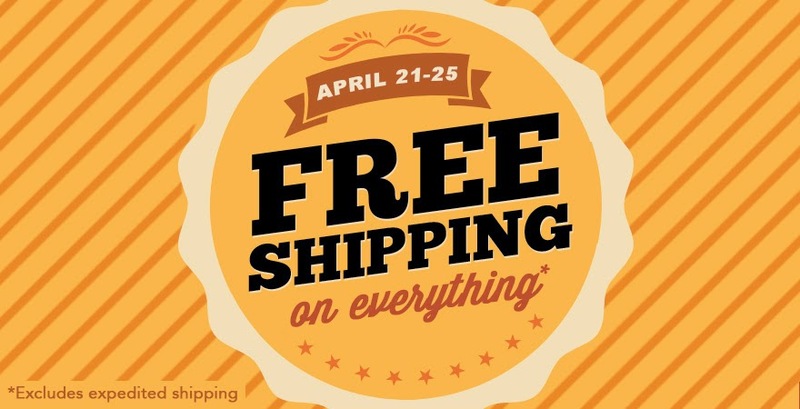 is offering FREE standard shipping on all orders between today and Friday! Add that to the Retirement List that came out today, and you have the chance to grab those must-have items before they're gone and save enough on shipping to add a few more items! I must say, I was shocked....SHOCKED, I tell ya, at some of the items on the list. Dazzling Diamonds Glitter? Noooooo! And the Silver Glimmer Paper?! *gasp! * *swoon! * *thud! * Whatever will I do for bling, especially at Christmas? 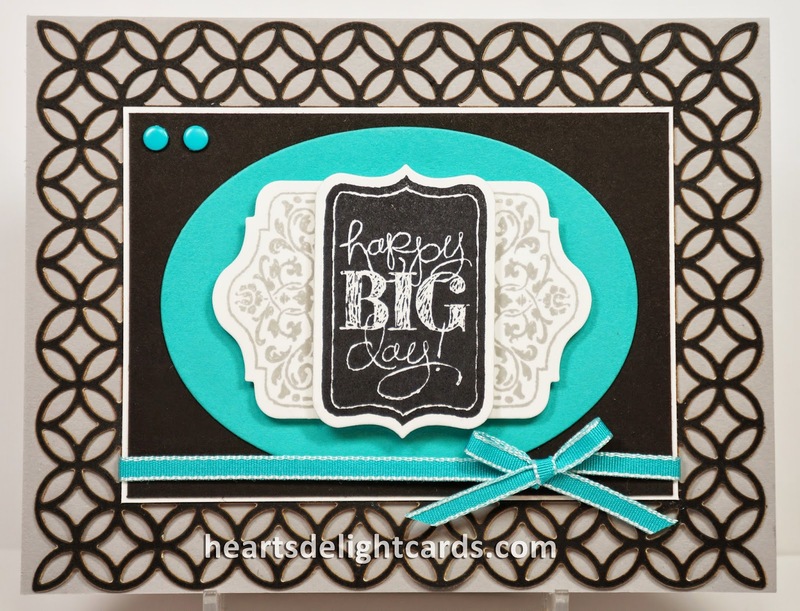 The lists are extensive, and I'm hoping that all the retiring Big Shot dies and embossing folders means there are many more new ones coming in the new catalog. Needless to say, due to the free shipping offer, these things are going to disappear quickly, and this year (for the first time) that includes the stamps, which are also on a "while supplies last" basis. So, peeps, if you've been lusting after wanting something, and have been holding off (for whatever crazy reason), NOW is the time to get it. I have a serious suspicion that a lot of stuff will be gone forever by Friday, so don't wait! To see the list click HERE. If you have any questions about the retirement list or free shipping offer, please don't hesitiate to contact me! Tour de Freaks, April Edition! Hello, tourists, and welcome to the April 2014 Tour de Freaks blog tour! Our theme this month started out as masculine cards/projects, and morphed into masculine or gender-neutral. Either way, it's always something I struggle with because I want to add bling and ribbons/bows and flowers to everything! So, this was a challenge for me, and it's always good to challenge yourself, isn't it? If you started at the beginning of the tour, you just landed here from Debbie Henderson's blog. Weren't her projects fab?! If you started here on my blog, just click the link at the bottom of each post and you will be taken to all nine Freaks' blogs. For the three cards I have today, I tried to stick with neutral-ish colors (is that a word? ), something that would work for either a male or female. But all of them are punched up with some Basic Black! 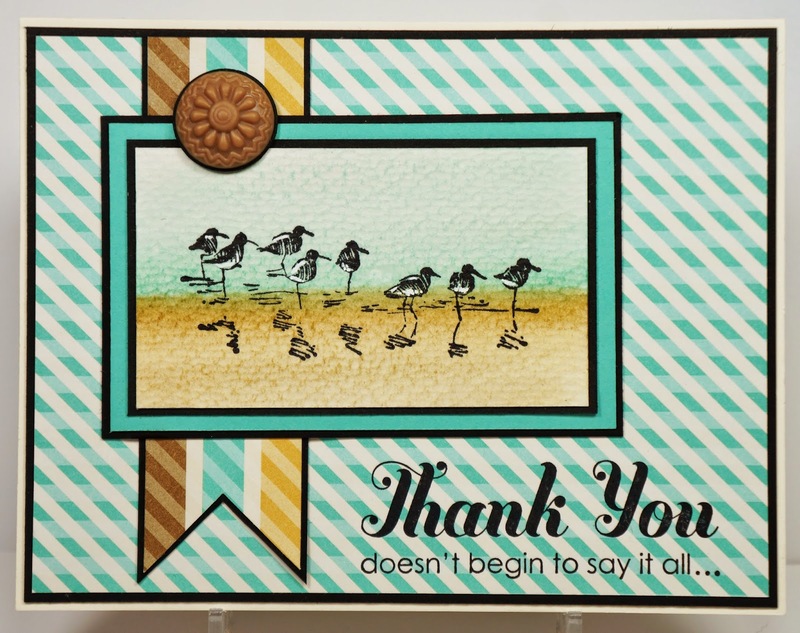 My first card uses the Sandpipers from the Wetlands stamp set. I really, really, REALLY hope that set isn't on the retiring list that's coming out on Monday. It's such a great, versatile set, I'd hate to see it go! Up next is another versatile set, Timeless Talk. Baked Brown Sugar was sponged on the edges to give an antiqued look, in keeping with the gramophone. I can almost hear Rudy Vallee singing Happy Birthday with that hollow, tinny sound, can't you? The greeting was stamped in StazOn on a word bubble from the Essentials Wooden Elements embellishments. I don't know why I haven't used any of these before today - they are such a fun way to add a little something different, and wooden elements are all the rage right now! 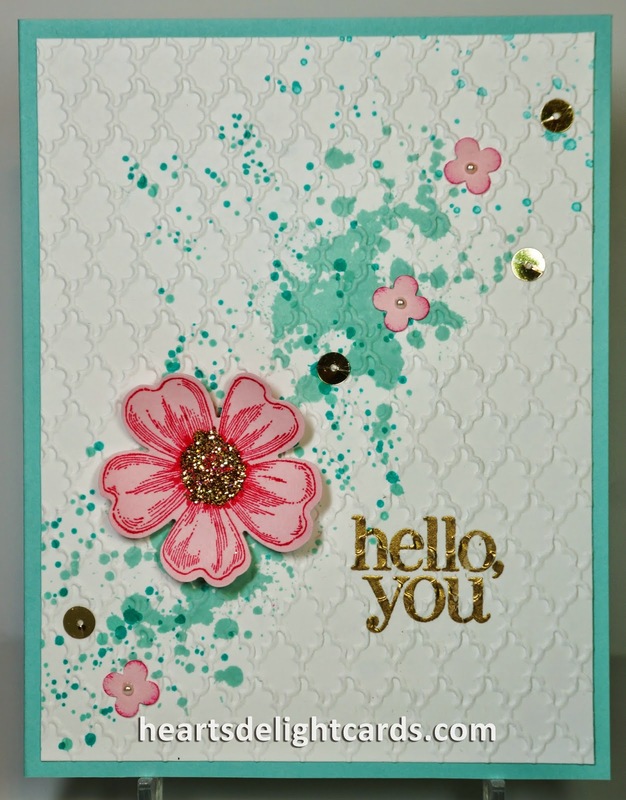 For the last card, I used some elements from the Simply Fabulous Simply Sent kit. I liked the kit when I saw it, but it was a bit too subtle for my taste. As I was thinking of ways to make it "pop" more, it struck me that I could change the color of the die-cut by swiping an ink pad all over it! Voila, instant "pop"! Now, I realize there is a bow on it, but I still think it would work for a manly man because of the strong colors. This is a card for a different swap that I sent off last week. I'm fairly certain everyone has received theirs, so it's okay for me to post it now! It was fun spotlighting the "HOW" to give it extra emphasis. It was popped up on a dimensional, too, for even more emphasis. "You're HOW old?!" Heehee!!! I can get away with it, because I'm older than everyone except God, so there won't be any bruised egos, haha. 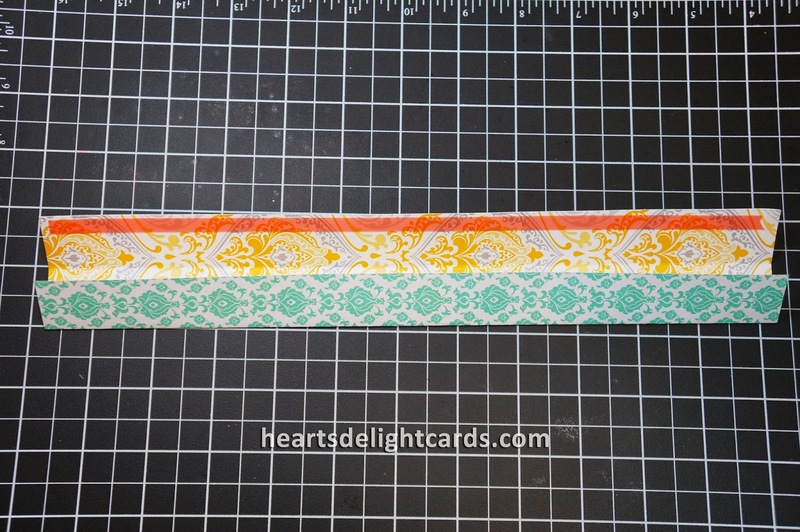 I have trouble using the chevron patterned paper, because it makes my eyeballs fall out, but I found if I toned it down with other patterned papers, it really wasn't so bad! 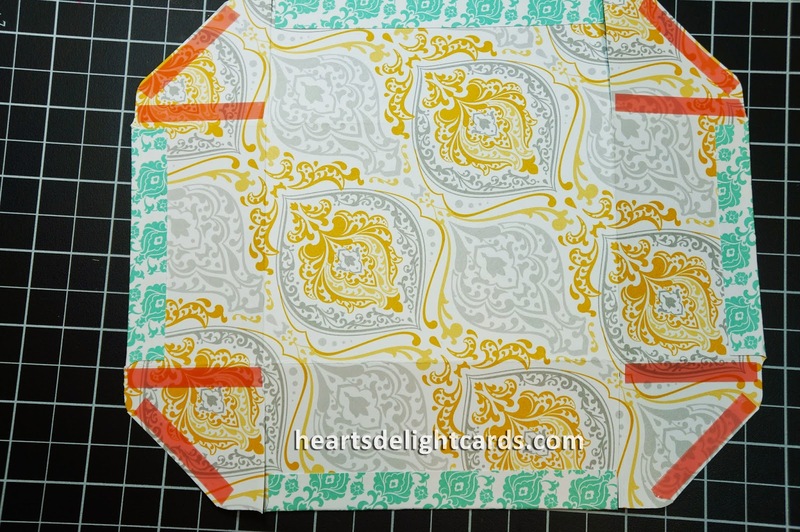 This really was an easy card to make, since most of the components could be punched or cut with the Big Shot. No fussy-cutting, just stamp, punch, adhere. Easy-peasy! The theme this time was "Flat and FABULOUS"! 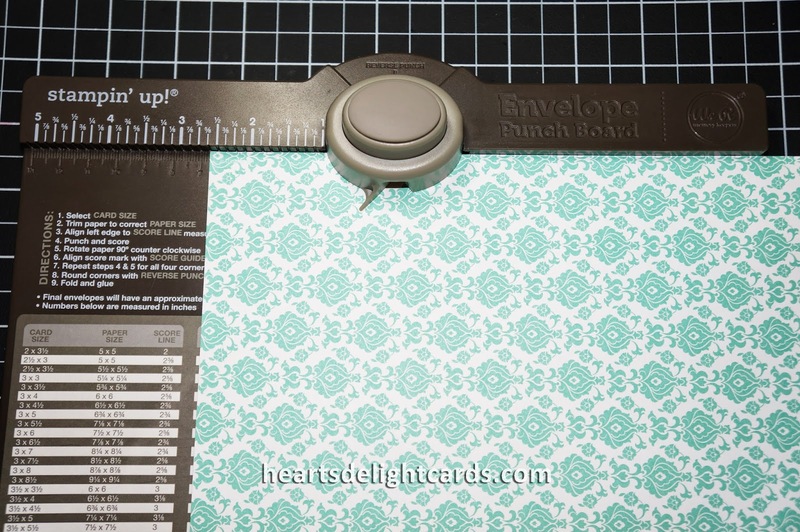 Since we've all run into problems mailing our multiple-layer, highly embellished cards, Lisa challenged us to make cards without bulky knots or bows, buttons, or brads. We could use the smallest Basic Jewels (pearls or rhinestones) or Candy Dots (without the brad bases). I love me a good challenge, so I set out to create something without too many layers, but with plenty of texture and visual interest. Nothing too CAS (clean and simple). I immediately thought of the loose sequins from the Gold Sequin Trim. Can't get much flatter than that, right? And I wanted to use fresh, Spring-y colors, since everyone has had more than their fill of Winter.